Tom Goreau: "goreau" (at) "bestweb" (dot) "net"
As an example of the work being done, below is a report of the Third Pemuteran Biorock Coral Reef Restoration Workshop, which was held November 21-28, 2005 at the Taman Sari Resort in Pemuteran, Bali, Indonesia. Nearly 60 participants attended the Third Biorock Coral Reef Restoration Workshop in Pemuteran, northwest Bali, Indonesia, during late November 2005. The Workshop was held at the Karang Lestari Project (“Protected Corals” in the Bahasa Indonesia language) in the Pemuteran Village Marine Protected Area. This is the world’s largest coral reef restoration project, and winner of national prizes for community-based environmental management and many international awards for ecotourism. The number of participants in the third workshop was about three times that of the second workshop (January 2004) and six times that of the first (October 2000). As in the previous workshop, the majority of participants were Indonesian, with the rest coming from Thailand, Australia, Japan, Malaysia, Singapore, Germany, Portugal, Italy, and Guam. The workshop was run purely from registration fees (with all Indonesian students admitted free) and in-kind donations of time, materials, equipment, and services by the organizers, sponsors, and lecturers, without any external funding. The workshop was led by Dr. Thomas J. Goreau, President of the Global Coral Reef Alliance (a non-profit organization of protection and sustainable management of coral reefs), and Professor Wolf Hilbertz, President of Sun and Sea (a non-profit organization for development of innovative construction materials), with extensive contributions by the participants. Participants obtained training in the theory and practice of Biorock® coral reef and fisheries restoration, shore protection, mariculture, materials production, integrated sustainable management of coastal zones and watersheds, and non-polluting ocean tidal energy. They received hands-on training in design, construction, installation, monitoring, maintenance, and repair of all current Biorock problem-solving applications. They developed and presented ideas for their own projects. A stunning new reef structure was designed, built, installed, connected, and seeded with corals by the participants. This structure, called the Crown, is the most spectacular of more than 50 Biorock reefs in Pemuteran. It is shaped in the form of three concentric hemispheres with attractive geometric openings. 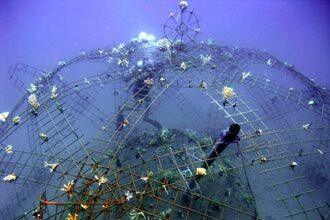 It was promptly planted with small coral fragments and a variety of fish and squid immediately moved in. The Pemuteran Village Reef Gardeners Program was launched at the same time as the workshop. This employs village youth to restore their remote reefs and manage them for eco-tourism and fisheries, and is funded by the Bali Recovery Fund. Workshop participants constructed four coral nursery modules for the Pemuteran Reef Gardeners Program to use for restoration of remote reefs. Participants also visited the nearby Gondol Research Institute for Mariculture of the Ministry of Fisheries and Marine Affairs, the largest and most advanced fish hatchery in Southeast Asia, and the North Bali Pearl Farm. After the workshop new projects are planned, and old ones will be upgraded, by participants in Tulamben, Sambirenteng, Scuba Seraya, Gondol, Les, Lovina, and Candi Dasa (Bali), Gili Trawangan (Lombok), Pulau Gangga (Minahasa, Sulawesi), Spermonde Islands (South Sulawesi), Pulau Pulau Seribu (Java), Lampung (Sumatra), Labuanbajo (Flores), Kota Kinabalu (Sabah, Malaysia), Ko Chang (Thailand), Singapore, Akajima (Okinawa, Japan), Bari (Italy), Nukunonnu (Tokelau), and other places. Research projects were planned on the effects of the Biorock process on coral feeding, reproduction, settlement, growth, and survival, on the variety, growth, and survival of fish, including introduced grouper hatchlings, and on oysters and clams. Shore protection projects are being developed in Indonesia and in extremely low lying atolls in the Central Pacific that are threatened by global sea level rise and global warming. 1. The Karang Lestari Project has clearly demonstrated the practicality and cost-effectiveness of large-scale coral reef restoration. Because of the rapidly increasing deterioration of coral reefs worldwide, and the imminent threat of global warming to all remaining corals, it is urgent that the international funding agencies make funding of large scale coral reef and fisheries restoration projects and shore protection projects their immediate top marine priority worldwide. 3. The Ministry of Fisheries and Marine Affairs should release more juvenile fish hatchlings into restored reefs and monitor their growth and survival. 4. New research and training programs in coral reef and fisheries restoration, mariculture, shore protection, and water quality management are urgently needed in Indonesian Universities, and projects need to be funded for students graduating from such programs to get jobs applying their skills and knowledge for the betterment of Indonesia’s renewable natural resources. 5. The Ministry of Energy should urgently seek funds to implement pilot projects in tidal energy development. 6. Much more extensive programs are needed for erosion control and recycling of sewage effluents on land in order to prevent pollution of the marine environment. Special thanks go to Agung Prana, President of the Bali Tourism Association and owner of Taman Sari Resort, Dr. I. Gede Ardika, former Indonesian Minister of Tourism, and Dr. Jamaludin Jompa, head of the Coral Reef Research Institute at Hasanudin University in Makassar, Sulawesi, for addressing the Workshop Opening. We thank the Pemuteran Village Gamelan Orchestra and the ReefSeen Balinese Dancers for their beautiful traditional opening performance. We thank Pak Beratha and Pak Narayana for months of hard work organizing the workshop and ensuring that it ran without a hitch, and Cody Shwaiko for countless invaluable suggestions and help. We thank Rani Morrow-Wuigk for helping start the Karang Lestari Project and documenting its progress. We thank Chris Brown for training the Reef Gardeners, and Dude for donating materials and equipment for the Crown. We thank Archipelago Dives, ReefSeen Divers, and Werner Lau Diving Center for lending diving gear. We thank the entire staff of Taman Sari for making the workshop so enjoyable, especially Mekel Gede Putu Yasa for orchestrating logistics, and Ma’dan and I Gusti Ngurah Juni Ariawan for their tireless engineering expertise. We thank Komang Astika, Dr. Jamaludin Jompa, Cipto Aji Gunawan, Ramadian Bachtiar, Beginer Subhan, Hawis, and Christiane Waldrich for addressing the workshop. Thanks go to the staff and management of the Gondol Research Institute for Mariculture and North Bali Pearls for field trips to their state of the art operations. And special thanks go to the people of Pemuteran for using traditional Adat laws to support conservation and systematically supporting all efforts to develop and apply innovative new methods for sustainable environmental management. Without all of them, and too many more to name individually the workshop would not have been the great success it was. Thomas Sarkisian: "thomas" (at) "biorock-thailand" (dot) "com"
Pak Beratha: "tamanri" (at) "indosat" (dot) "net" (dot) "id"